Camp Manatee is a nature-based specialty camp that teaches youth about the wonders of the environment through interactive games, activities, crafts, and field trips. Our camps offer a unique experience for children ages 6 to 14, by giving them the opportunity to think outside the box, and the building in order to experience nature first hand. The campers have the opportunity to learn about various ecosystems that can be found throughout South Florida through field trips and interpretive talks. Campers will be encouraged to learn about the past history of Florida Civilizations from early Native Americans (such as the Tequesta) to present civilizations. In order to make learning fun for our campers we go on a wide array of field trips in order to reinforce the weekly themes. Campers will have the opportunity to visit various natural sites like Crandon Park, and Flamingo Gardens as well as some historic sites like the Deering Estate at Cutler. During the summer we make sure to provide some traditional summer field trips like trips to the pool, so the children have time to enjoy the joys of summer. When it comes to activities, we try to keep it safe, educational, and fun! Our campers will have the opportunity to go on daily nature hikes with their groups, see and participate in exciting science experiments once a week, create and nurture friendships. 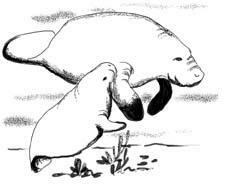 Camp Manatee’s Counselor In Training Program is for individuals 15-17 yrs. old. The CITs will assist the counselors throughout the day with games, activities, crafts, and maintenance of the facility. The campers are ages 6 to 14 year old and are split up into groups of 12 for a total of 60 campers. We go weekly to the pool and on an all-day field trip. The CITs are responsible for covering field trip costs. The Counselor-in-Training program requires a minimum commitment of Three (3) consecutive weeks. There is no fee for this program, but enrollment is limited. To apply, you must complete and return Miami-Dade County Parks – Volunteer Application and affidavit. Each applicant will be notified upon acceptance or rejection. Decisions are made on a first come, first served basis, taking into consideration the CIT’s availability and qualifications, and the camp needs. Everyone accepted into the CIT program will be required to attend the mandatory CIT Orientation. CITs will learn about Camp Manatee’s policies and procedures including what is expected of them when working with campers. CITs will also be responsible for any field trip costs.